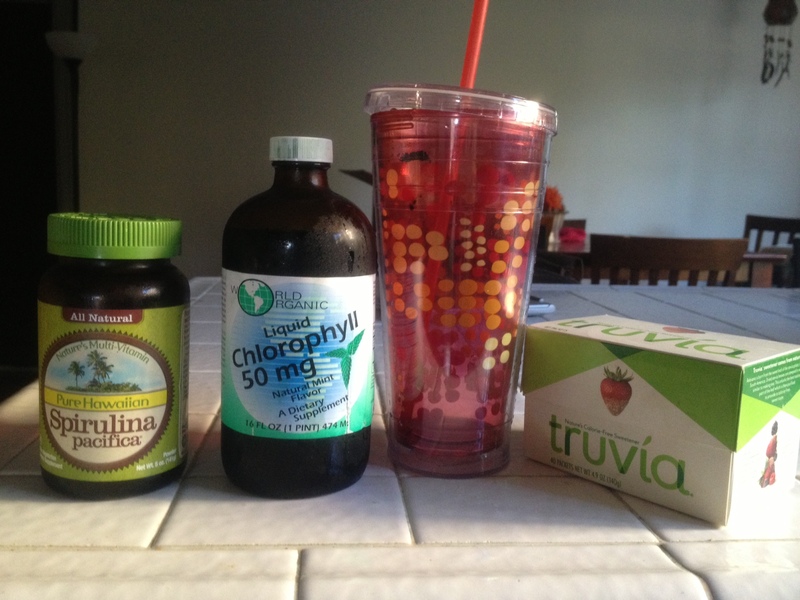 spirulina powder, mint-flavored chlorophyll, a 20-oz cup of water with a straw, and a stevia sweetener. I’m always researching information related to health and wellness and trying to incorporate my newest findings into my repertoire of diet and supplementing. On one such quest, I discovered the super food, Spirulina. An algae turned into powder and bottled up in the vitamin section of your nearby health food store, this super food is packed with vitamins and trace minerals, with testimonials claiming that it boosts immunity, fights free radicals, helps digestion, and supports cardiovascular health. I decided to try it out, especially after hearing about its high amount of iron and calcium. By little boys don’t really care for milk or any milk-alternative and don’t really care for meat—so I’m always looking for ways to increase their iron and calcium. Well, when I bought the powder and brought it home, I excitedly scooped out a teaspoon of powder and dumped it into my cup then poured my water into it and stirred. When I took the first sip, I gagged. This was disgusting. It truly tasted like pond scum, no way around it. I began to drink quickly, fighting off my reflex to gag. When I finally finished the last muddy sip, I recovered by the sink, dry heaving, and praying I could keep it all down. Thankfully after a few deep breaths and some fresh water to take the taste from my mouth, I was able to regain my composure and jump onto the internet to find some recipes that would help the taste. I could NOT do that again! The recipes, I found, however, just didn’t meet my needs. Almost all of them either required a juicer or a blender and involved incorporating fruit and other veggies to mask the flavor. I want a quick drink that I can chug down and be done with. I don’t want to cut up or wash fruit and I certainly don’t want to pull out my juicer or Vitamix blender. Those are great. But I don’t have time to make this a daily routine, and I do want spirulina to be a daily supplement. Tonight, I figured out a way to make a quick spirulina drink that actually didn’t make me gag. It actually tasted good! I’m so excited about it that I had to share it with those out there also looking. 1/2 packet of Stevia (I normally use Truvia Natural Sweetener, Spoonable, 9.8 Ounce Jar ). a large cup with a straw. I first put the powder into my cup, then added the water, then topped that off with the mint-flavored chlorophyll and the stevia sweetener. Then I mixed it thoroughly with the straw until all was blended and ready do drink. It tasted great! It was mildly sweet and earthy with a touch of mint. sweetner? hmm, not for me but thanks for the effort, it’s a hard one! Thanks for the comment Bob. What is your issue with sweetner? Would love to know more details. Any other ways you have learned to make spirulina taste good? What I personally like about Stevia is that it is a root. And its non-synthetic. It doesn’t even raise your glucose levels because it isn’t actually a sugar-based ingredient. It just happens to taste sweet. this is such a hilarious post… exactly the same thing happened to me just now, and here I am, browsing on how to make it taste good! haha… I’ll have to give it a try! Your post made me laugh out loud! I found it researching how to make a tasty spirulina drink. At first I had great success with juicing it with cucumber, lettuce a dash of apple juice and lime juice, together with pure stevia extract. However, I am looking for an laternative way without the juicing as I need to cut out fruit juice for the time being. I appreciate your idea, though am not convined the mint essence witll do it. I’ll try it tomorrow though. Thanks for posting. The key is less spirulina and more water! You will notice I only put a tsp of the powder in. Hope you like it!!! So what did you think of the mint, Sophia? Pingback: Get 20,000 video views on YouTube - simple hack! Haha! Just done exactly the same thing and this was the first site I clicked on! I have peppermint teabags, might try it in that tomorrow! Thanks for the peppermint advice!! How did it work, Marianne?